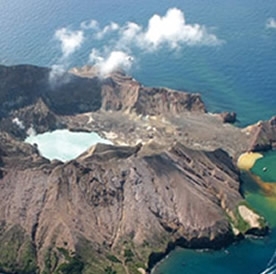 Whakaari or White Island is an active volcano, situated 48km from the coastal town, Whakatane. The island is the largest of the four islands in the Olive Island chain. It is roughly circular, about 2km in diameter and rises to a height of 321m above sea level. However, this is only the peak of a much larger submarine mountain, which rises up to 1600m above the nearby seafloor. The main activities on the island now are guided tours and scientific research. White Island Whakatane attracts visitors from all over the world including a variety of sealife. White Island is also one of the world’s best scuba-diving destinations and provides a unique experience as you can explore the underwater steam vents or commune with large schools of fish. It attracts hundreds of divers from all over the world every year. White Island is accessible by boat or helicopter or opt for a scenic flight over the island. Bookings to White island on boat can be made from the Cortez office upon arrival, or at time of phone enquiry. Looking for Whakatane charter boats? Fishing charters in Whakatane and the Bay of Plenty are among the best in the world. From saltwater fishing to freshwater fishing for trout in rivers and lakes. 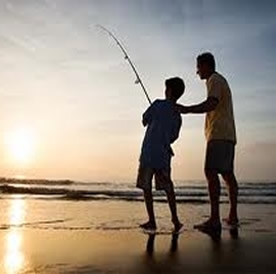 Whakatane fishing is rated by top fishing correspondents as New Zealand’s best all-round fishing destination. During the summer months many different fish can be caught in the waters accessed from the port of Whakatane. These include yellow fin, skipjack and albacore tuna, along with sharks and marlin, congregating to feed on huge shoals of baitfish from December to late April. Whakatane is the country’s yellow-fin tuna "capital" but superb fighting marlin along with snapper and hapuka lurk around the many off-shore reefs. Whakatane charter boats are ready and waiting to seek them out and assist with your fishing experience. Diving Whakatane is a must for any keen diver. White Island and the Volkner Rocks marine reserve is one of the world’s best scuba-diving destinations and provides a unique diving experience around a live marine volcano. Visibility is typically excellent as you can explore the underwater steam vents or commune with large schools of fish. Located 48km off the shores of Whakatane, it’s easily accessible through one of the local dive operators. It attracts hundreds of divers from all over the world every year. Dolphins are abundant in the waters off Whakatane and our tour operators can take you to swim with, or watch, these fascinating mammals in their natural environment. It is a truly spectacular experience in the clear subtropical waters off Whakatane. Closer to shore is the Seafire Shipwreck just off White Island. Looking to surf around Whakatane? Surfing is a popular pastime in the Bay of Plenty and Whakatane district offers some of the best waves around. Try the top breaks along the Matata coast or try the waves at the Whakatane Heads. Experience the fun and thrill of the surfing lifestyle at the beautiful West End, Ohope Beach. Surfing fanatics are catered for all year round. Try surf lessons or simply paddle out and give it a go on your own surfboard. Whakatane and Ohope Golf clubs offer some of the most prestigious golf courses in the Bay of Plenty. Whether it's the fast running greens or the lush forgiving fairways, Whakatane and Ohope golf clubs offer golfers of all levels a challenging and rewarding 18 holes. Whakatane golf club is situated inland of the Coastlands region while Ohope golf club enjoys the spectacular views offered by the Ohiwa Harbour and Ohope Beach.